Authorship Determined by Jacob Bernays. A Judæo-Hellenistic poet and the author of a didactic poem in epic style of 250 verses. He assumed the name of the ancient gnomic bard Phocylides of Miletus; and medieval scholars, regardless of criticism, accepted his composition as a genuine classic work. Since its ethical teachings are of the highest, and in entire harmony with Christian and monotheistic doctrines, it was used until the sixteenth century and even later as one of the most popular school manuals of epic style; and only after classical philology had been firmly established on a critical basis was discarded the naive belief that an ancient heathen poet had preached monotheism and a system of ethics of equal purity centuries before Christianity was known. The problem of the authorship of this poem was first solved by Jacob Bernays in 1856. He proved that the composition was entirely dependent on the Bible and was directly opposed to heathenism, while there was no allusion whatever in it to Christianity or to the New Testament, which showed that it was absolutely uninfluenced by Christian teachings. He proved also that the source of the most essential teachings of the work is the Pentateuch. These precepts are especially the so-called law of reason, which the author hoped would appear acceptable to the Gentiles; for such prohibitions as those respecting eating flesh torn by an animal (="ṭerefah"; verses 139, 147-148; comp. Ex. xxii. 30), or taking the mother bird and her brood together from thenest (verse 84; comp. Deut. xxii. 6), may be considered moral laws. Commandments which apply especially to the Jews are not mentioned by pseudo-Phocylides, since he could not hope that the Gentiles would listen to them. It was, therefore, the laws that were binding upon the Noachidæ which the pseudo-Phocylides preached (Krauss, in "R. E. J." xlvii. 32); he, however, omitted the prohibition against idolatry, which he, curiously enough, did not attack, probably for the simple reason that he wished to preserve his anonymity, in which case he does not deserve in any degree Bernays' reproach of luke warmness and cowardice. 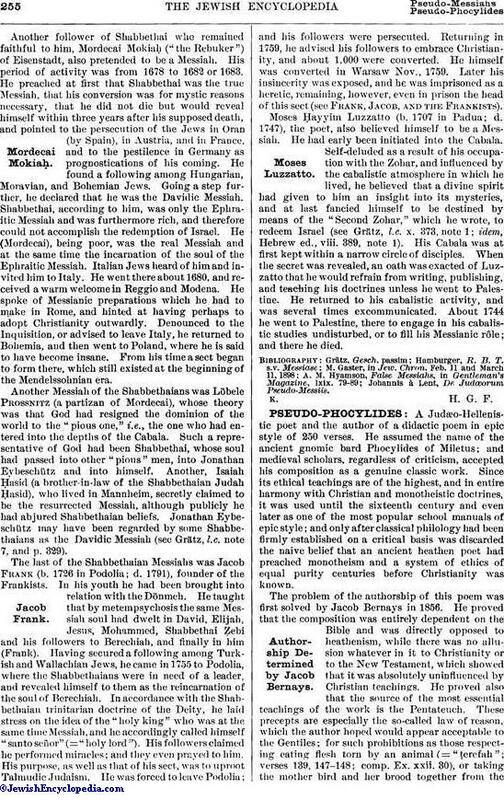 The essentially Jewish character of the poem of pseudo-Phocylides is proved by the fact that his precepts may all be traced to the Bible. 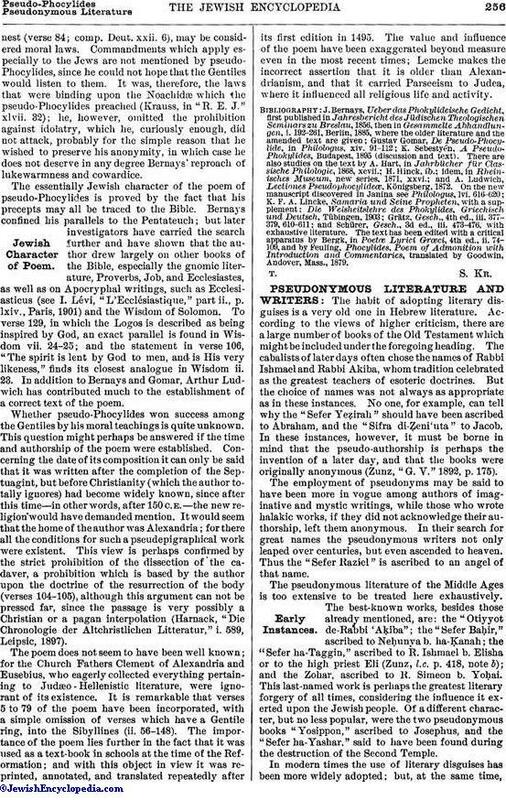 Bernays confined his parallels to the Pentateuch; but later investigators have carried the search further and have shown that the author drew largely on other books of the Bible, especially the gnomic literature, Proverbs, Job, and Ecclesiastes, as well as on Apocryphal writings, such as Ecclesiasticus (see I. Lévi, "L'Ecclésiastique," part ii., p. lxiv., Paris, 1901) and the Wisdom of Solomon. To verse 129, in which the Logos is described as being inspired by God, an exact parallel is found in Wisdom vii. 24-25; and the statement in verse 106, "The spirit is lent by God to men, and is His very likeness," finds its closest analogue in Wisdom ii. 23. In addition to Bernays and Gomar, Arthur Ludwich has contributed much to the establishment of a correct text of the poem. Whether pseudo-Phocylides won success among the Gentiles by his moral teachings is quite unknown. This question might perhaps be answered if the time and authorship of the poem were established. Concerning the date of its composition it can only be said that it was written after the completion of the Septuagint, but before Christianity (which the author totally ignores) had become widely known, since after this time—in other words, after 150 C.E.—the new religion would have demanded mention. It would seem that the home of the author was Alexandria; for there all the conditions for such a pseudepigraphical work were existent. This view is perhaps confirmed by the strict prohibition of the dissection of the cadaver, a prohibition which is based by the author upon the doctrine of the resurrection of the body (verses 104-105), although this argument can not be pressed far, since the passage is very possibly a Christian or a pagan interpolation (Harnack, "Die Chronologie der Altchristlichen Litteratur," i. 589, Leipsic, 1897). The poem does not seem to have been well known; for the Church Fathers Clement of Alexandria and Eusebius, who eagerly collected everything pertaining to Judæo-Hellenistic literature, were ignorant of its existence. It is remarkable that verses 5 to 79 of the poem have been incorporated, with a simple omission of verses which have a Gentile ring, into the Sibyllines (ii. 56-148). The importance of the poem lies further in the fact that it was used as a text-book in schools at the time of the Reformation; and with this object in view it was reprinted, annotated, and translated repeatedly after its first edition in 1495. The value and influence of the poem have been exaggerated beyond measure even in the most recent times; Lemcke makes the incorrect assertion that it is older than Alexandrianism, and that it carried Parseeism to Judea, where it influenced all religious life and activity. K. Sebestyén, A Pseudo-Phokylides, Budapest, 1895 (discussion and text). and A. Ludwich. Leetiones Pseudophocylideœ, Königsberg. 1872.
and Schürer, Gesch., 3d ed., iii. 473-476, with exhaustive literature. The text has been edited with a critical apparatus by Bergk, in Poetœ Lyrici Grœci, 4th ed., ii. 74-109, and by Feuling, Phocylides, Poem of Admonition with Introduction and Commentaries, translated by Goodwin, Andover, Mass., 1879.